Thousands attended the Escondido Street Fair in 2013-14. Care for a little sympathy with some tea? 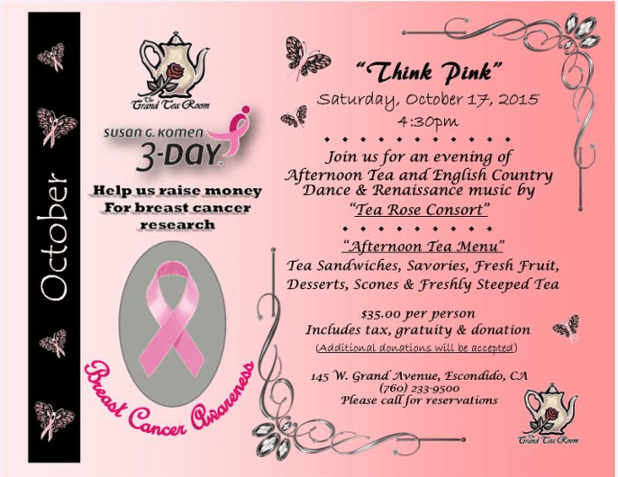 Grand Tea Room is hosting “Think Pink” to raise money for breast cancer research. It’s part of this weekend’s Susan G. Komen 3-Day Breast Cancer Awareness walk, and at 4:30 p.m. Saturday, Oct. 17. Afternoon Grand Tea is $35, all included. It features tea sandwiches, “savories,” fresh fruit, desserts, scones and, obviously, freshly steeped tea. Donations go to breast cancer research. 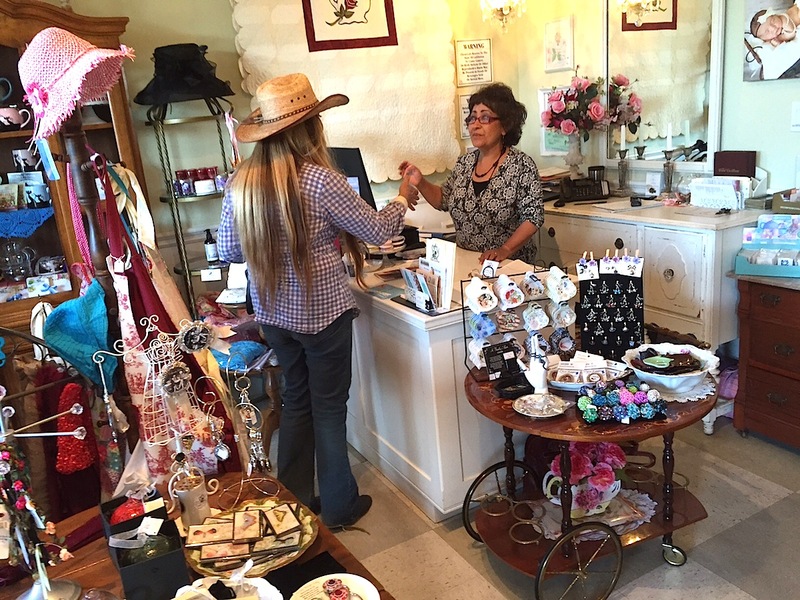 Louisa Magoon greets Shera Sandwell at The Grand Tea Room. The Grand Tea Room rose from the ashes of a difficult situation. Lousia Magoon faced the prospect of the restaurant she had worked 21 years at being sold to new owners. She decided to take a love of tea and tea rooms to the next level. As one door closed, the doors to The Grand Tea Room opened in 2010. It’s all happening at 145 W. Grand Avenue. Reservations are requested, it is a Grand Tea after all. Call (760) 233-9500 for more information. Ok, maybe the “e” is a bit over the top, but otherwise the Escondido Street Fair(e) is a whole lot of fun. This is the second of two annual such events and, as such, fills Grand Avenue with booths, music and food, etc. from Centre City parkway to Ivy Street. Fair(e) fun runs from 10 a.m. to 6 p.m. Sunday, Oct. 18, according to the city of Escondido. The Escondido Chamber of Commerce that sponsors the event along with the Escondido Downtown Business Association said it runs from 9:30 a.m. to 5:30 p.m. Take your pick. The three groups probably ought to get on the same page on the event name. The Chamber and City called it the Grand Avenue Festival. The Downtown Business Association called it the Escondido Grand Avenue Festival Street Faire. In any event, it features 550 to 700 booths, depending on the source. All sources agree it also features live entertainment, arts/crafts, farmers market, international foods and more. The next fest(e) will be May 16. But for this one, call (760) 745-2125 or visit http://escondidochamber.org for more information. Escondido Public Library will host Halloween Carnival & Día de los Muertos from 3:30 p.m. to 5 p.m. in the Turrentin Room. This family-oriented celebration includes stations with “spook-tacular” crafts, face-painting, and sugar skull decorating. As a special feature, two Día de los Muertos story times will be held, one at 3:45 p.m., and the second at 4:30 p.m.
For more information, visit library.escondido.org or contact Cecy Rayphole, Senior Library Associate, at 760-839-4289 or at crayphole@escondido.org. Then, there’s the big Kahuna, the Dia de los Muertos Festival Presented by the California Center for the Arts, Escondido in partnership with the Crescentera Foundation.. The festival begins at 6 pm and is free and open to the public. Visitors will not need a ticket to enjoy the festival, but you can RSVP below to stay informed about this and other free community events here at the Center. Dau of the Dead at Cal Center for the Arts. This is the 20th Annual Día de los Muertos Festival. 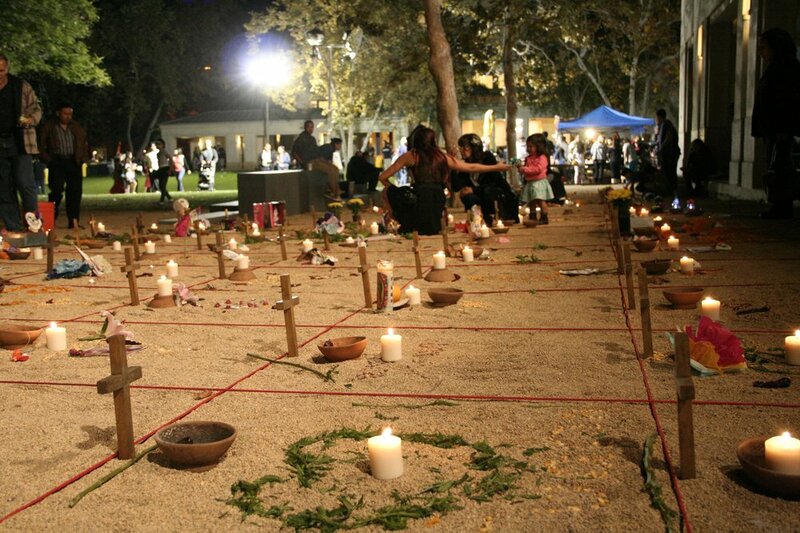 Each year, guests are invited to create altars to remember and honor their loved ones in a special area outside of the Center’s museum. While these altars are the focus of the festival, the event will also feature live music by So de San Diego and Mariachi Divinas and Ballet Folklorico by youth from Tierra Caliente Academy of Arts. The Center’s Museum exhibition, Re-Membering Our Ancestors Discovering ourselves, will be free and open to the public for the duration of the Festival. Additionally, Visitors can enjoy free face painting, sugar skull decorating, and other celebratory activities. Traditional Mexican fare will also be available for purchase. For more information, call (760) 839-4138 or visit http://artcenter.org/event/dia-de-los-muertos-festival/.